One day, Molly was walking in the forest when a Mysterious Thing rolled out from behind a fern. Molly lives on a peaceful farm near a Mysterious Forest, which she loves to explore. When she finds a Mysterious Thing, she decides to take it home and, when it hatches and out comes a baby dinosaur, she decides to keep him as a pet, and name him Rex. But Rex grows quickly, and Molly soon realises that having a dinosaur on a farm can be a big problem. Dogosaurus is a humorous offering, which youngsters will lvoe for its silliness. At the same time, the gentle underlying messages of conversation and ownership are valuable. Rex is a friendly looking, playful dinosaur with goggly eyes and a goofy smile so that even when he wreaks havoc, he is endearing to readers. Great for young dinosaur fans, or anyone who needs a smile. Every Saturday, Jake spends time with his dad at his dad’s place. They both love Space and spend the day happily together, playing, exploring, eating and sharing movies. But one day Jake arrives to discover a Space Alien. He is not happy. And not shy about letting the Space Alien know it. Over the next visits, he does everything to repel the Space Alien, but nothing works until he loses his cool completely. Paperback with bright and colourful illustrations, with much of the text large and loud. Jake has a wonderful time with his dad each weekend, but when his dad starts seeing someone, everything changes. 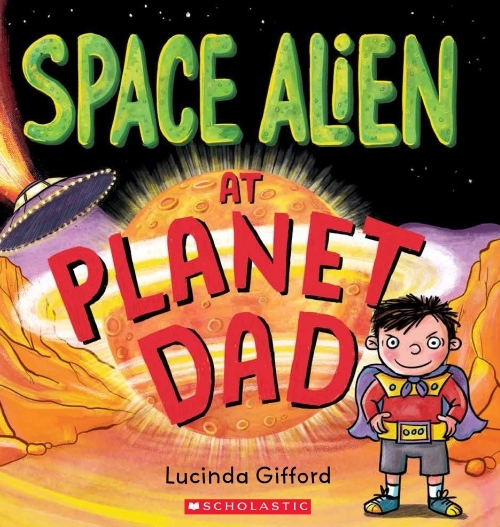 Space Alien at Planet Daduses wonderful space-themed language, huge letters and voice bubbles to let the reader know just how upset he is. Dad does all he can to convince Jake that the Alien is worth knowing, but Jake continues his resistance. This is a wonderful book for families adjusting to new and unfamiliar configurations. Recommended for pre- and early-schoolers, particularly those in changing family circumstances.